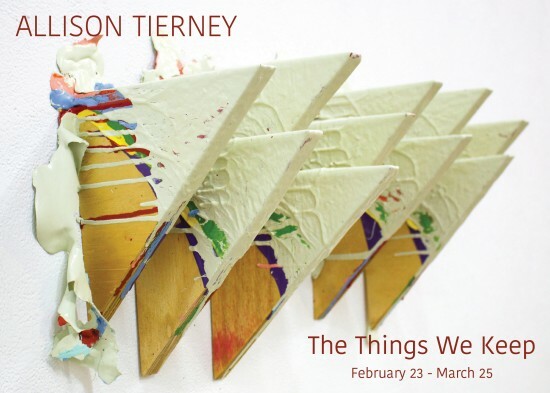 Georgia Southern University’s Betty Foy Sanders Department of Art presents Allison Tierney’s The Things We Keep, from Feb. 23 to March 25 on-campus in the Contemporary Gallery of the Center for Art & Theatre. The exhibition includes an artist talk Feb. 23 at 5 p.m. in Visual Arts Building, room 2071 with a reception to follow at the Center for Art & Theatre. The events are free, and the public is welcome. Tierney’s paintings employ found materials and non-traditional applications of paint to question structure, material integrity, consumerism, D-I-Y, and the throwaway culture. The works speak to content of domesticity, waste, time, landscape, and femininity. “Since the majority of my materials are found, they come with their own histories, forms, and physical qualities. I exploit this material baggage to see how far painting can be pushed,” Tierney writes. Tierney’s honest use of materials and abstracted brushwork allow the objects used in her work to exist where they are—self-referential, notating their original purpose. The work explores the spatial capacities of painting beginning with the surface. Items embedded within the canvas or sitting flush to the surface become part of the narrative. The work also examines space through what is happening around the canvas or off the wall. This includes indirect effects of the work such as shadows and lighting, but also can involve an extension of the picture plane or free-standing sculptures. As perspective shifts begin to occur, the viewer has an opportunity to interact with the work in a variety of ways and can interpret their connections with the materials, creating limitless personal narratives. Tierney’s project is made possible by an Ella Fountain Pratt Emerging Artists Grant from the Durham Arts Council with support from the North Carolina Arts Council, a division of the Department of Cultural Resources. Tierney is an artist living and working in Chapel Hill, North Carolina. She received her B.F.A. from Winthrop University and her M.F.A. from the University of North Carolina Chapel Hill where she won the Top Prize for Outstanding M.F.A. work.